W. Wyatt Gill : Canoes in the Ellice Islands, 1885. The Religious Tract Society, [London], 1885. PAlong with some information about the importance of canoes for the Ellice islanders, the book has a very dramatic illustration of large waves breaking on a coral reef, page 10. 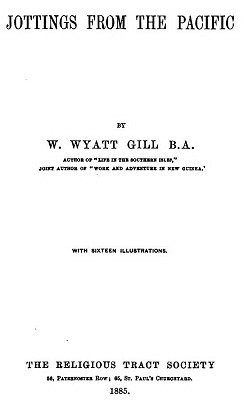 Chapter II demonstrates the adoption of traditional cultural values by local evangelists in preaching the message of the Gospel. In August of 1872, in company with a valued brother missionary, I spent a pleasant day on this atoll. Unlike several of the nine islands constituting the Ellice Group, there is no opening in the reef to admit a vessel or boat into the central lagoon. A fleet of war-ships might sail into the magnificent lagoon of the neighbouring island of Funafuti, and anchor in safety. Approaching the reef of Niutao as near as was prudent in the ship's boat, we were borne one at a time in a canoe on the foaming crest of a huge wave to the external ledge of jagged coral, where the teachers gave us a joyous welcome. A few moments, and we were soon inside a comfortable mission-house, reflecting infinite credit upon teachers and people. A fat chief of Atiu, named Akaina, paid a visit to the island of Mauke - a distance of fifty-five miles. Canoes from Atin first make Mitiaro, and after resting there awhile, start again for Mauke. For such voyages, instead of a single canoe steadied by an outrigger, it is customary to fasten together two canoes and lay a deck across them. 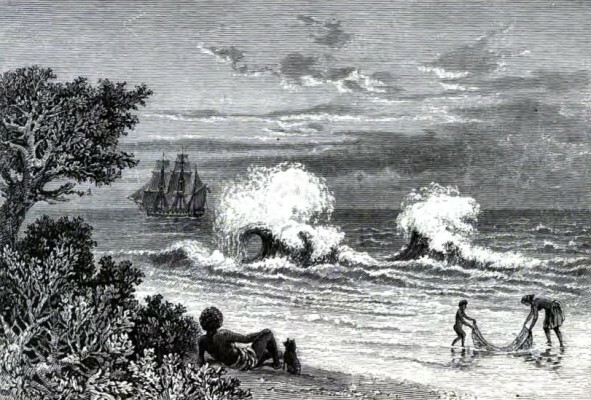 A mast is then set up ; and with the aid of a large mat sail, plaited from the leaves of the pandanus, they rapidly skim the surface of the ocean. Guided by the stars only, these islanders have in this manner found their way from island to island from time immemorial. Occasionally, however, they are driven out of their course, and are either lost at sea or fetched up on some distant isle. It is in this way that the multitudinous islands of the Pacific have become populated. Several years ago the writer gave to the public some illustrations of Scripture truth culled from native sermons and addresses, to which he had listened with delight when resident in Mangaia. After a long residence in Earotonga - an island one hundred and ten miles distant from that on which he formerly laboured - it has occurred to him to present to the public some recent illustrations, so as to assist in forming a judgment as to the substantial unity of thought on Bible truths amongst native Christians of different islands in the South Pacific. "Our canoe is being launched. She is on the outer edge of the reef. The surf every second lifts her higher. The crew stand around, awaiting the favourable moment to start on their projected voyage. No; the incoming wave is too short. Now, perhaps, is the time ? Look alive; here comes the long billow. Now is the right moment. Shove her off; scramble in. She is shooting through the white foam to the blue ocean beyond !" To Luka, the impassioned speaker, and to his audience the canoe represented the offers of eternal life made in the Gospel. Now is the accepted time. A moment's delay, and it may be too late. It is a most interesting thing to witness the launching of a canoe, in a rough sea, on a coral island where no opening exists. The ninth wave is the right one. An error in judgment involves the swamping of the canoe, and sometimes loss of life. The propounding and solving of riddles is a pleasant pastime for young people at home on long winter evenings. In the South Pacific it has been from time immemorial the serious employment of bearded and even grey-headed men. In the following brief collection many are obviously modern, but others are undoubtedly ancient. 3. What exceeds all other things in swiftness ? 4. A band of warriors fighting unweariedly day and night? Billows dashing against the reef. 11. What plant has only one root and one leaf? A kite; often made out of a single gigantic chesnut leaf. The tail represents the root. 16. Who shows his joy behind ? A dog wagging his tail. 23. "Who shouts all day and night ? The surf on the reef. 29. What beats a drum at one end and dances at the other ? A dog barking and wagging his tail for joy. Geoff Cater (2013) : W. Wyatt Gill : Canoes in the Ellice Islands, 1885.
shades into brilliant pearly lustre on the inner curve. his flesh was forbidden to the common man. stance of the use of the aspirate in the language. tug at the oars for incessant hours without wearying. their reef whether the Apolima pass is practicable. you have to take your chances. moment ago you were wishing you were well out of it. of the narrow passage between lagoon and raging sea. banks of fine spray on the threshold of the island gate. val, it is known that that is indeed the wave to use. wave shatters over upon the immovable obstacle. would be torn to rags between the boat and the rock. ventured so much to see the island. too weak to take a step for a long time afterward. the chance to get out.